CONSULTING. MACHINING . PROJECT ASSURANCE. Agility and Innovation are the hallmarks of success - our business is set on this foundation. Starting a new venture or project is much more than simply bringing in equipment and resources. It requires careful thought and execution, and increasingly an eye to the constraints imposed by local and non-local governments. Our experience with new product lines and facilities has always been focused on how they can be established effectively and efficiently in order to maximize gains. At Newcastle we are project and program managers, with certified PMPs on the team. 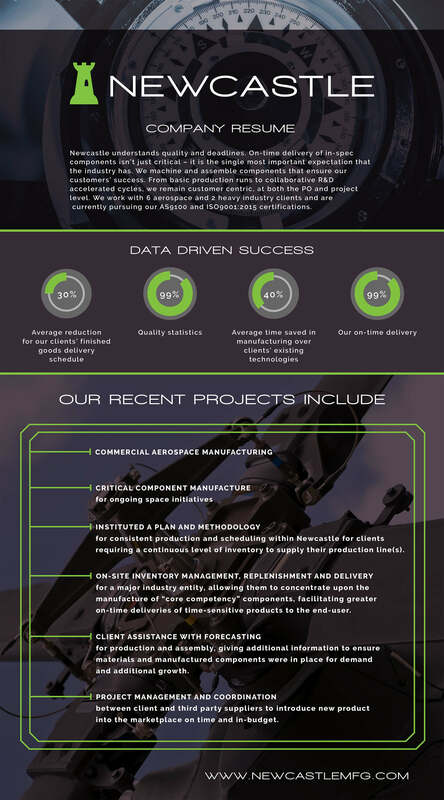 We have spent the last 15 years controlling the project life-cycle to assure our clients’ goals were met. We remain committed to this discipline today. As a client advocate and team member we understand quality and deadlines. On-time delivery of in-spec components isn’t just critical – it is the single most important expectation that the industry has. We strive to machine and assemble components that ensure our customers’ success but we offer more than that; from basic production runs to collaborative R&D accelerated cycles, we remain customer centric, at both the PO and project level. The industry is moving rapidly and expected to grow exponentially in the next decade with technological advances in all sectors. Development life-cycles are shortening to meet the existing demand, emerging needs and competition. At Newcastle we have determined that we will meet those needs, be a leading manufacturer in the industry and we will assist our clients in building their success through intelligent manufacturing and assembly. Copyright © 2015 Newcastle Manufacturing.